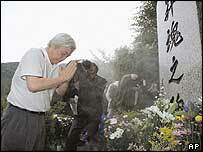 The people of Japan are marking the 20th anniversary of the world's worst single-plane air disaster, in which 520 people died. Japan Airlines President Toshiyuki Shimmachi joined 300 mourners on the remote mountainside in Gunma where the plane came down. "I pledged strongly to the 520 souls that such a disaster would never be repeated," Mr Shimmachi said. Bereaved families said prayers and lit a candle for each of the dead. "I wish I could visit here every day to be with my daughters. I miss them deeply," Shingo Tabuchi, who lost three young girls in the crash, told the Japanese broadcaster NHK. Japan Airlines Flight 123 - a Boeing 747 - was en route to Tokyo from Osaka on 12 August 1985, when it came down on the forested mountainside. All but four people on board were killed. Experts decided that the crash had been caused by faulty repairs by the US manufacturer Boeing, which staff at Japan Airlines had failed to detect. "We vow firmly to maintain safety. This is our social responsibility," Mr Shimmachi was quoted as telling assembled mourners. The crash anniversary comes soon after a series of safety lapses at Japan Airlines. In June, the tyres of two front wheels of a plane came off during the landing of a domestic flight. In January, a pilot attempted to take off without being given the required approval from air traffic controllers.